Hospital and Skilled Nursing Facilities (nursing homes) kitchens are different than other foodservice kitchens. The equipment and supplies they use may include many items found in commercial kitchens along with a whole variety of healthcare specific items. From pans, lids, cutting boards, food pans and storage containers to bases, plate covers, bowls and meal delivery trays, and therapeutic aides, a healthcare kitchen goes through an assortment of products. This wide array comes a familiar challenge: finding the space to properly dry and store the different shapes and sizes. It is not surprising that one of the most commonly cited violations in these environments are wet nesting occurring with dishes, pans or trays. Hospitals and nursing homes, are environments where many patients already are challenged with low immune systems. It is important to minimize the spread of harmful bacteria caused by wet-nesting, and is critical to maintaining patient’s health. A vital tool in this fight is using the right drying rack designed for healthcare operations. 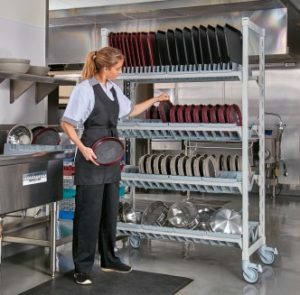 For more information on Cambro’s Angled Drying Racks and other healthcare products, contact THG’s local healthcare director.